~Eternal Snow~: Vocaloid Spotlight: Hatsune Miku - Letter Song. Wow, it's been quite a while since my last Vocaloid Spotlight post, and hoping to break the mass amount of photo posts in the past 2 weeks or so, I will be doing one now. Actually, while on a whim, I just decided to pay a visit to doriko's blog (a original Miku song composer), and it seemed that there was a new song which was just posted on the 27/06. Taking this opportunity due to laziness, I'll be doing a post on it. 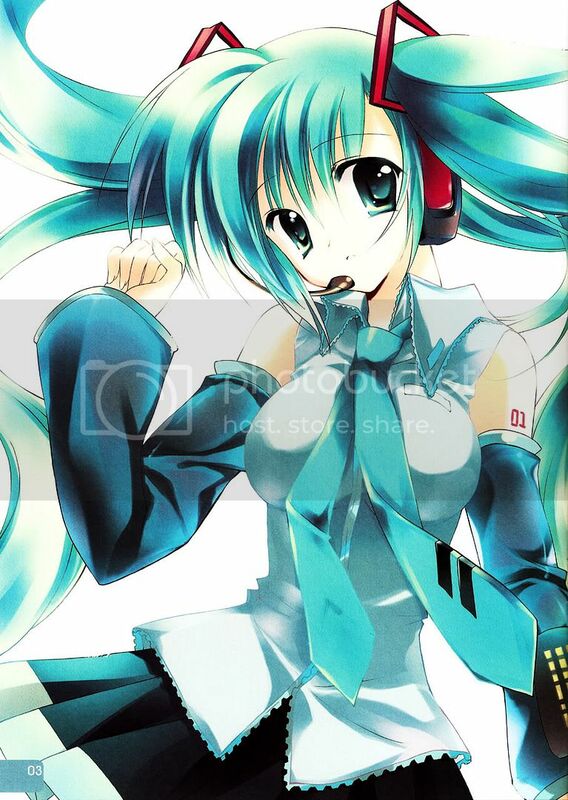 Scanned picture of Miku from a doujin called Miku☆Miku☆Miracle! by REI'S Room. I personally scanned and did some colour touch up myself using Photoshop CS3 (in the process of learning how to use). It's not a very good scan though, noticed some bad areas in certain parts. Will rescan in the near future (and other pics too). Hatsune Miku -「letter song」 by doriko. Letter Song is a slow paced peaceful piece, that is based around the theme of "self-reflection". In one way, this song is a follow up of doriko's previous song, Yuuhizaka (my post on it here). Writing a (song) letter to yourself 10 years from now, is a concept that is quite common. It may not be a letter, or could be just a thought, or maybe a blog (like what I'm doing now? ), but surely we tend to look back and question ourselves if we're truly happy with the path that we had chosen in our lives. Actually, it's quite a coincidence, as last night I was chatting with Squee and C.I over MSN about our past and stuff, and at the same time I was browsing through my old blog entries, looking at my old quotes and poems in them. Reading them once again was somewhat like a "self-reflection", and I thought back to my mentality then, which I would say had a pretty dark outlook at life. I think I'll do a post on that in the future too, with my old quotes and poems too ^^. Anyway, hope you'll enjoy the song, I shall now go and do more "self-reflection" on my current's life heading (and maybe fall into depression at the same time). And here's a little quote that I did before, a little teaser. Signing out. "Holding onto memories can be of great strength, but binded the mind be, the downfall of many to pass." LOL Hirito, did you use levels and curves on the scan? Looks like it. Also, no depression pl0x. Stay Happy! Yea I mainly only adjust the levels and curves (that's like all I currently know LOL). Need to learn more!